An exploratory field in my case. 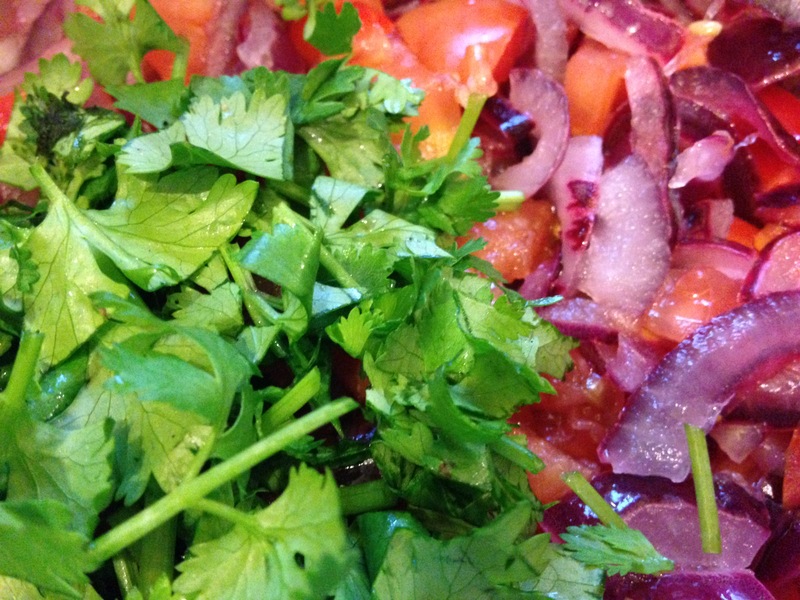 This recipe for onion salsa was taught to my boyfriend, Marc, by Ecuador’s culinary gift to the world (and Marc’s best friend’s mom), Leonor. You might not think you like red onions this much, but make this one time and you will be amazed. It’s like a pickled onion, but squared. It’s like an onion morphed into a space unicorn and drove Apollo’s chariot into your taste buds. Think of it as pico de gallo, but with a shift in the ratio of ingredients. 1. Wash your hands. I know that you have been scratching inappropriately. 2. Slice onions lengthwise, then thinly crosswise. Slice once more to achieve see-through onion half-rainbows. (1) Cut onion from top to bottom. (2) Slice each half thinly. (3) Cut the slices in half. 3. Transfer your sliced onions to a mixing bowl and cover them with Kosher salt. It should look like your onions are blanketed in snow (scroll down for slideshow visuals). 4. Cover the onion/salt mixture with cool water. Massage the onions, salt, and water together for five minutes. Let the mixture sit for an additional five minutes while you dice your Roma tomatoes and cilantro (and jalapeño, if needed). Do not add these to the mixture yet. 5. At this point, the onions should be limp and somewhat translucent. If the onions are still hard, let them sit for another couple of minutes. Pour the onion mixture into a colander and rinse with cool water. Return onions to mixing bowl, add water, massage, and repeat the straining process. This will ensure that your onions are not overly salty. 6. Return the onions to the mixing bowl and use a fork to juice all three limes over the onion mixture. To get the most juice, roll the limes on the counter and apply pressure by hand before you cut them. 7. Add the tomatoes and cilantro to the mix. Fold the mixture with your hands. Taste the salsa and add more salt if desired. 8. Select desired Netflix program and proceed to stuff face. This salsa is delicious when served with black beans and rice, or on top of some grilled chicken. Or get some Tostito’s Scoops and just go to town.